Actually, this is my wife’s car. She loves V8s. 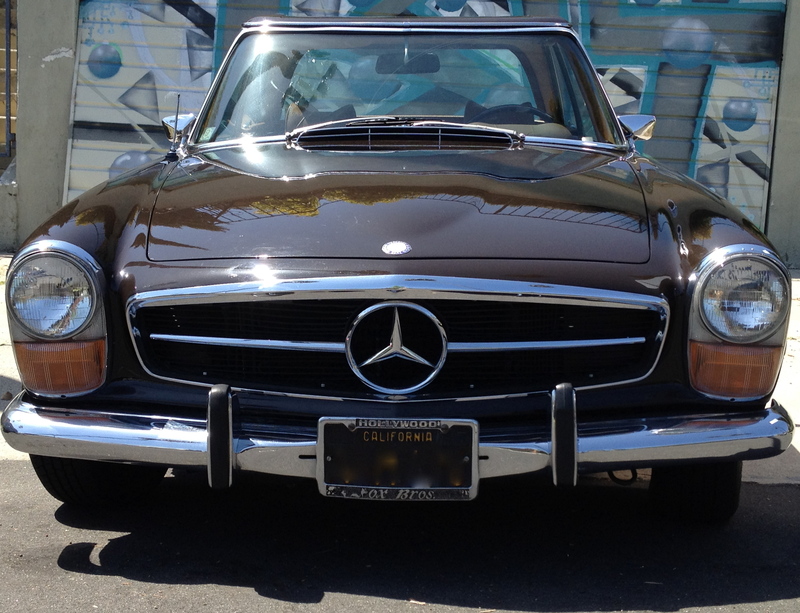 When I met her she had (and still has) “Beatrice,” a 1968 280SL California Coupe. It is her first classic car and she is the second owner. 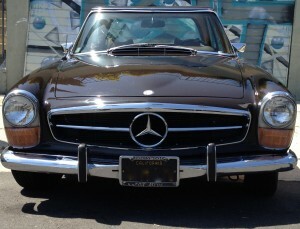 It is a Los Angeles black-plate car, with one very nice re-spray in the correct brown color, and enough patina everywhere else to defy any sane person to restore it. The first thing she asked me when she told me about the car was if there was a way to improve the performance of the car to be more like her well driven BMW 5er. A precursory look around told me that the existing engine was pretty well maxed out power-wise with its debatable 170 horses, and on paper the swing axles didn’t impress. We took the car on a few driving events, and despite its appearance on paper, the car actually handled quite well, sliding predictably and easily rotated. The 4 wheel disc brakes impressed as well, reminding me of Alfas I have owned in the past. The straining engine screaming its head off at 70 mph more than offset these traits however. After pricing the cost of mechanical redoing of the smoky and tired engine, and realizing it would be more of the same after good money spent unless further money were spent reengineering the car to do what it should be capable of doing anyway, I gently suggested that she should consider something a bit more sporting. This suggestion was well received, and the car was put up for sale. Around this time, the Los Angeles Auto Show reared its ugly head, and we decided to attend. While there, my wife noticed a booth in the convention center basement with a beautifully restored 1971 280 SE 3.5 coupe parked in the middle of it. On closer inspection, it had an AMG V8 of some type in the engine bay, most likely a M119 variant, and the brochure lying on the roof had a picture of a 280SL. This German outfit claimed that they could retrofit modern drivelines into vintage Mercedes. This gave me an idea. As the car sits without a soft top, it seems like a more purposeful coupe suitable for sporting events and the like. Neither of us cares for convertibles so the top never comes off anyway. After being gently nudged to dig a little further into the updating/upgrading concept, I discovered that it is possible to change to a period Mercedes V8 without cutting the car. W108 brakes and rear axle, and Koni shocks. M116 engine, hopefully a 3.5 if I can find one. The original M116 manual transmission bits and pieces are tricky to find. I travel to Berlin periodically so hopefully some queries there may prove fruitful. A later 4.2 or possibly a 3.8 might work, but the trick is ultimately to figure out the best combo that can be made to take a manual gearbox in a Mercedes-like fashion. The bigger M117 (4.5, 5.0, 5.6) engines are more powerful, but taller and wider due to the added deck height. There is talk of a reverse engineered AMG 5 speed conversion for the late M117 and M119 (4.0, 4.2, 5.0, 6.0 DOHC 24 & 32V) engines and that could influence the build. I am wondering at this point if there is a call for two types of universal bell housings (early and late V8) that could accept a multitude of gearboxes depending on individual taste and availability. The car has AC and power steering, and will continue to, with the addition of iPod and Bluetooth capability (movie producers love their cell phones :0). I must admit I am as excited by the prospect of a hot rod Mercedes as she is. Early V8 Mercedes have always appealed since a childhood friend took me for a 120+ mph ride in his mother’s 450SE. I have always liked the look of the pagodas and a small well-fitting V8 seems like a great combination. True to my ethos, it will look factory original when I am finished. Hopefully some innovation on my end will translate to opportunities of choice for other enthusiasts.